UK: A part of Europe yet apart. This is the view of Britain that you can see if you look west from the edge of Europe. It has not changed since the birth of religion. This view remains constant. 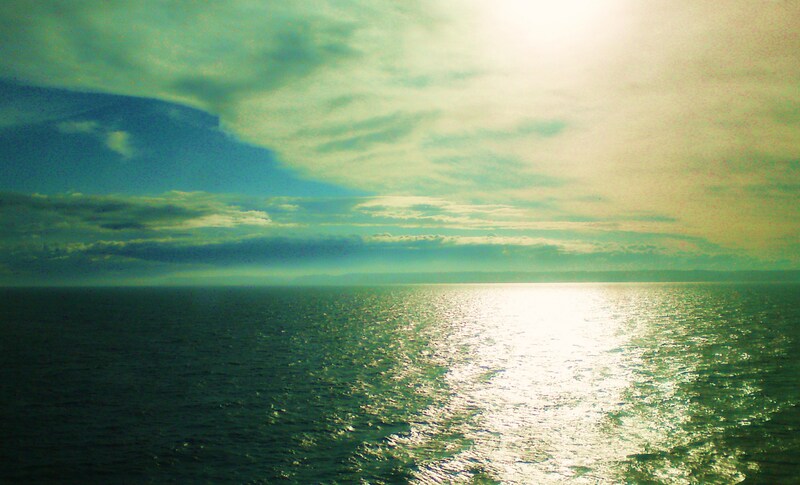 It is the view one gets from any ship or ferry that is heading to the Port of Dover, England. To the home-coming Brit, first time visitor or the migrant, this view emerges usually from a cloak of mist and cloud. The grey finger of land looms ever closer until great cliffs reveal the entrance to the small but restless port. These last few minutes of the journey let you see yourself and your fellow ferry travelers as you really are. On deck or looking through the huge windows from the passenger lounges, we all stare at this view in silence. There is nothing to point at, no comment worth making, no detail to arrest one’s thoughts until one is almost there. I watch as a group of young Eastern European men and women put arms around each other’s shoulders as they gaze. One of them turns and hugs his friend and I see his cheeks are streamed wet with tears, his reddened eyes blinking furiously. His friends crowd round and he breaks his embrace and laughs and hugs them. They all laugh and hug. By contrast, the well-dressed elderly couple turn away from the railing. He fishes a handkerchief from his sharply ironed trousers and blows his nose. She opens her handbag and suddenly rummages inside it as if attempting to kill a particularly defensive small rodent. Her shocked voice barks out to him, echoing across the deck above the hum and whine of the ship’s engines. ‘Yes.’ He replies, returning his handkerchief to its appointed pocket and inspecting with great enthusiasm the grey plastic decking beneath his brown and immaculately polished brogues. A mother and father spill out through the cabin door onto the deck and repeatedly call for Imogen. Imogen leaves her position by the hand rail near me and becomes tried, found guilty, sentenced and punished in the few seconds it needs for her tired parents to dispense rough justice. I watch as my brother takes a last photograph from the stern of the closely packed long-distance trucks that litter the open hold below. Sailors are cracking undone the chains that bind their dusty trailers to the deck and the ship’s tannoy is welcoming us to the Port of Dover in English, French and finally, Polish. Our great ferry is now shuddering violently as if something large and expensive to replace has broken loose in the engine room. The stern foams as black harbour water is angrily hurled elsewhere to let us turn and line up the bow doors with ramp number fourteen. The ferry over at ramp number nine begins to depart and we all start to file below, down the stairs to the car deck. As the 40 tonne trucks are let out of the holds beneath us, people go through the complex nesting procedures that are required to drive an unbroken journey from the dock to home, hundreds of miles inland. The baby’s bottle needs to be got from underneath the suitcase in the back. The raincoats need to be folded away on the left so that father can see out of the right. The lady in the Audi TT needs her driving shoes on and her stilettos off and stored behind her. Imogen needs to be reminded once more of areas in her behaviour where her mother seeks lasting improvement. I need to peel the black tape from my headlights so that they can once again shine more brightly to the left. I need to check the oil and water. Doing so fills the drivers behind me in the queue with horror. I am lifting the bonnet. I must have broken down. They are now trapped behind me. They will never be able to leave the ferry. I have ruined their entire holiday. I should not be allowed to drive. I drop the bonnet from shoulder height and stare back at them. Suckers. It works every time. Our passports were checked earlier by the French Customs officer at the port in France. Then again at the next cabin fifty metres further along in the concrete wasteland by the British Customs officer in France. Then, once parked up in lines and waiting for our ferry, our load space was again checked by a British Customs officer in France. Now, we leave the ship and join the queue that leads to the British Customs in Britain. Their concrete cave nestles at the foot of the towering cliffs of Dover. We are invited in. The British Customs in Britain dance and swerve between the two slowly moving queues of heavily laden cars. They wave and point and beckon, let three cars straight through then stop the fourth and lean in to ask a quick question of the driver. The driver must not do two things. He must not sound nervous when asked out of the blue if he has visited Holland and his breath must not smell of alcohol. Four policemen with loaded machine guns and hands on triggers ensure that we all focus on where we all are and why we are all here. You may look the policemen in the eye but you may not out-stare them. Not unless you wish to be beckoned to steer to the left and to a bay marked out on the wet concrete floor for those who may not understand. Look away. Appear bored and impatient. The Eastern Europeans in their minibus are waved straight through. Customs are already fully aware who they are. The old couple are stopped. Duty Free alcohol. Where is it? How many bottles? Are there more bottles they have bought in France? Where? In the back? Show me. Fine. Thank you. Move on. The old man’s face is flushed. He was not expecting that. The customs officer knows that and that is precisely why he stopped him. You’d be surprised who tries to break the law. My brother and I are waved straight through. Our car is sunken on its springs with over a hundred wine bottles that fill the cabin and boot under our coats and jackets. The Customs officers already know that. We are on a day trip. We are bound to be maxed out on wine that costs a quarter of the British price and tastes twice as good. We won’t be smuggling. You don’t get rich smuggling wine using a VW Golf. You use a Mercedes estate with self-levelling suspension, like the old couple did. I am bringing into Britain what I am entitled to by British Customs. EU law says that the British are allowed to bring as much of whatever they want into Britain as members of a free-trade union of countries called the European Union. That is what free trade is all about. But that cuts no ice with British Customs officials. They say that I am only allowed to bring in 100 litres of wine and a kilo of tobacco. Every now and then. Not too often. Britain is different. We are an island. See photo at top of page for further clarification. ← Obama Wins Second Term. World Breathes Out.